“Change” is probably the best word that qualifies the UK energy landscape of the last decade. Through bold decisions and strong commitment on climate, the UK is changing its energy system and paving the way towards a new secure, affordable and low carbon energy future. When National Grid, the Great Britain system operator, launched its first consultation on Enhanced Frequency Response back in 2016, EDF through its affiliates, engineering teams and R&D arm was among the first to welcome this announcement and put forward its expertise in order to design, build and now operate the largest project awarded at the end of the competitive process. Enhanced Frequency Response is a new dynamic service set by National Grid, where active power must change rapidly (sub 1 second) as a function of the system frequency. Batteries are of course technically well placed to provide this service due to their fast response to a given power request. Moreover, the technology neutral call for tender issued by National Grid also confirmed that they are cost-competitive for such needs, as winners of the call for tenders were finally all battery storage projects. West Burton B is a CCGT gas power station situated in the county of Nottinghamshire in England, approximately 250km north of London. Commissioned in 2013, it comprises 3 units and has a total capacity of about 1.3 GW. 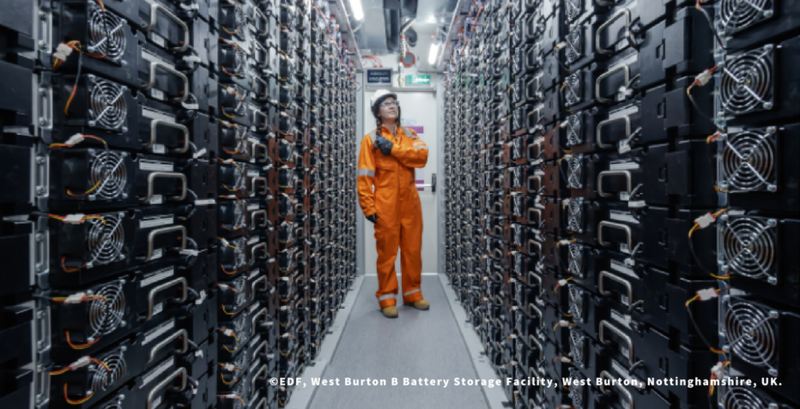 EDF Ingeum’s engineering skills enabled this pioneering step for EDF to deploy a large battery energy storage asset within a conventional plant to create such an innovative “energy park”. This project also leveraged 25 years of experience in energy storage at EDF’s R&D. Such commitment has enabled the development of key skills and tools to support technology selection, confirm key performance indicators, prototype and validate integrated solution in a representative environment and optimise business models. In a changing energy landscape, EDF is ramping up its efforts to develop electricity storage solutions and become the European leader in this field. Within the framework of its ambitious electricity storage plant, EDF’s goal is to develop 10 GW of additional storage around the world by 2035 (€8 billion investment), on top of the 5 GW already operated by the Group.